I’m so grateful to be part of my Bootcamp. It’s really opened me up to new opportunities and we’ve become such a family. Having completed the Race For Life, next on our list was this. I’d never heard of it before, but loved the concept. You don’t have to run the 5k, you can jog, walk, dance, skip, cartwheel for all you like, it’s all about fun. Along the way, at every 1k you get showered in coloured, eco-friendly, plant based powdered dye. 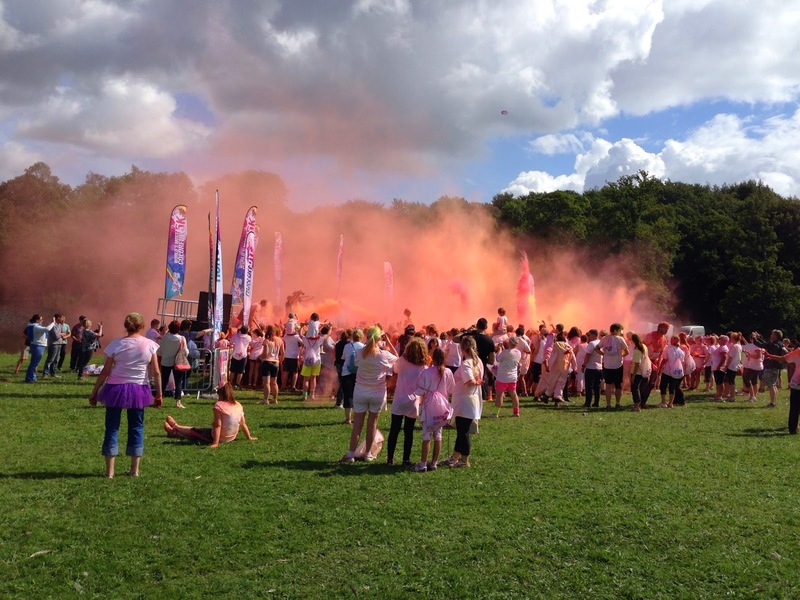 Then once you reach the end of the course there’s a Finish Festival with tunes and a colour storm! If you sign up in advance to their mailing list you get priority booking and a cheaper price. I believe I paid £23. After a month the price then increases to £28 and increases again to £33 2 weeks before the event. On the day you get a pack, which contains a t shirt, extra dye packet, event race number and a goody swag bag. As a team we opted to wear the provided white Run or Dye t shirts but accessorised with our own Bootcamp branded headbands. Although they say that the dye is washable, they advise not to wear your best/most expensive clothing, so I bought some cheap leggings. The run was held at CASTLE HOWARD, York. A beautiful setting non the less, but on this day it was made colourful to say the least. It was amazing run around the grounds. Sadly, there was rain the night before, so some of the grounds/woodland was muddy and boggy, which made it fun. But we ended up in a que while people carefully dodged it as much as possible without losing a trainer! I have to say, it didn’t feel like 3 miles. I think because we kept stopping due to crowds and mud and then running through the Dye clouds, while being pelted, plus the amazing scenery, it seemed to fly by! I was still glad to see the finish line though! Once everyone had completed the run, the colour party began, was tunes booming and dye being blown across the crowds by a what I can only describe as one of the guys from LMFAO with a leaves blower! It was an amazing sight seeing all the different colours blowing through the air and the colours of people leaving! With it being our first year there, we really enjoyed it and plan to do it again next year, adding in taking a picnic, our own loo roll and (some alcohol!). I totally recommend to anyone to do this next year. You don’t have to be an Olympic athlete, or even a good runner. It’s a fun run. A day to enjoy with friends.